One of the nation’s true stars of the U.S. criminal justice system, former criminal court judge, Jeanine Pirro, has been hard at work covering the corruption, fraud and misconduct of the Democratic Party, and investigating the activities of the denizens of the Deep State for her Fox News Channel show. According to Judge Jeanine, a former prosecutor and judge from New York’s Westchester County, the Obama White House, the Clinton family and the Washington, D.C. swamp-dwellers did everything possible — including fabricating evidence such as the discredited “dirty dossier” that was used to obtain search warrants from the FISA (Foreign Intelligence Surveillance Act) court — to help get Hillary Clinton get elected. Barack Obama, Hillary Clinton and Bill Clinton called in every favor that they possibly could during the 2016 election to try to sway everything away from Donald Trump. And still these “criminal masterminds” couldn’t stop the Trump Train from rolling into the White House. However, the Democratic Party, using tactics derived from the early 20th Century communists and national socialists and from the bestselling handbook “Rules for Radicals” by Saul Alinsky, are attempting to stop President Donald Trump from succeeding as the nation’s leader with the ultimate goal of removing him from office by impeachment based on false charges and perjured testimony. Even the news media are working overtime in their pursuit of true or false stories to help the leftists tear down Trump’s successes and destroy his presidency. 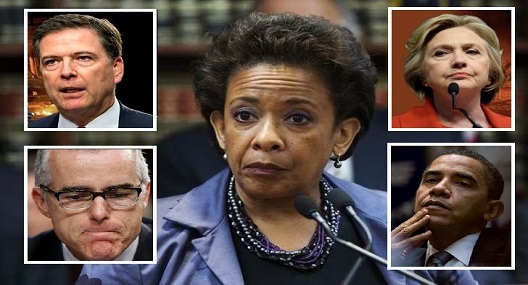 Loretta Lynch (Center) with other Deep State operatives: (Top) James Comey and Hillary Clinton. (Bottom) Neil McCabe and Barack Obama. But now, in spite of the news media’s lack of interest in true journalism, new information indicates that Obama’s Attorney General Loretta Lynch was more involved in the anti-Trump, Deep State conspiracy than investigators first believed. “We have recently discovered some vital information about the character of Loretta Lynch,” said Judge Pirro. Jeanine has just revealed that the U.S. law insisted that the FBI not put a spy in the Trump campaign unless one condition is met — Attorney General Loretta Lynch must approve and sign off on it. This latest revelation only make it clearer that Obama administration officials were actually tampering with the presidential election by using practices usually reserved for organized crime or illegal-alien gangs or cartels. “All of this could have ended before it even begun, but Hillary and her minions were insistent that they do everything in their power to beat president Trump in the election,” said Judge Jeanine, who ran as a Republican for the U.S. Senate against Democrat Hillary Clinton. The news media knew back Hillary Clinton’s husband pardoned terrorists from a Puerto Rican independence group who were in prison for bombings that killed and injured New Yorkers in the 1970s to help get the Puerto Rican and Latino votes in New York. The placing of a spy within Trump’s campaign was purely political and aimed at assuring that Hillary Clinton would win the election. The list of Obama officials who may soon see the inside of a courtroom is quickly piling up. They include but are not limited to James Comey, Sally Yates, Andrew McCabe, Samantha Power, Susan Rice, Ben Rhodes, Rod Rosenstein, James Clapper, John Brennan and of course, Loretta Lynch. What would be of great interest is what part Susan Rice and Ben Rhodes played in the Trump caper, since Rice is married to the former ABC Executive Producer Ian Cameron and Ben Rhode’s brother David Rhodes is the president of CBS News. I admire Judge Pirro!! She calls it like I’m thinking. If anyone can get to the bottom of this Clinton/ Uranium One mess, she can.